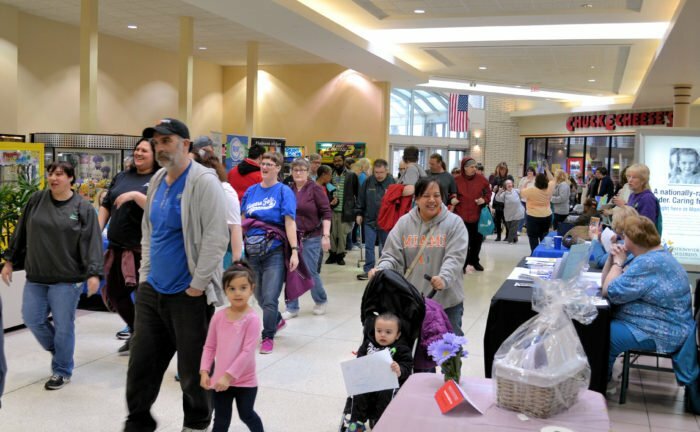 Dozens of people from Richland County and beyond took part Friday in the 2nd Annual Step Into Spring Fun Walk at the Richland Mall. The free event culminated local activities to mark March as Developmental Disabilities Awareness Month. There was no required walking distance, although participants were encouraged to do at least two laps inside the mall or the equivalent of one mile. The first 100 people who signed in received a goodie bag. During a short program prior to the walk, participants heard from Julie Burkhart, a certified nurse practitioner from Avita Health System. Burkhart talked about the benefits of walking. Step Into Spring also featured an information fair. Several agencies and providers of services for individuals with developmental disabilities and their families offered brochures and other handouts and were available to answer questions. Richland Newhope/Richland County Board of Developmental Disabilities (RCBDD) held the walk in collaboration with Richland Public Health, Richland County Children Services, the Mansfield Y, and the Richland Mall.